I want to share some of the neat things about Living Room that I cover in my new manual. 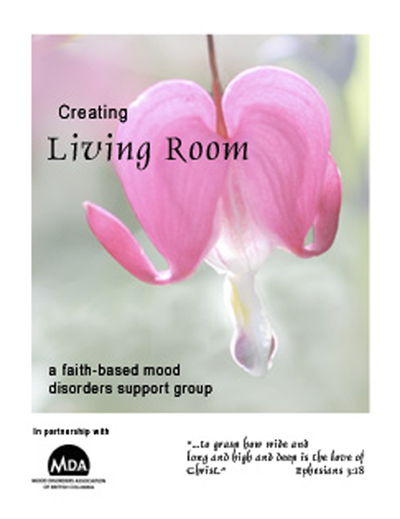 Living Room is a Christian self-help group for people with depression, anxiety and bipolar disorders. Ideally facilitators should have one of these problems; they will be better able to identify – better able to support. The group is in partnership with a mood disorder association. This helps avoid the danger of trying to spiritualize the problems too much – something Christian groups need to watch out for. It’s obvious how participants can benefit from this place where they can share their troubles with others, at the same time discussing their faith. Finding out they’re not alone helps them gather encouragement and strength. But how does the church benefit? The church responds to Christ’s call to love and help people in need. It helps people who are often shunned in the community. It helps break down the stigma of mental illness by promoting prayer and support for the participants. It helps make mental illness an acceptable topic of conversation, encouraging others to be open about their struggles and search out treatment and support. It gives members of the congregation opportunities to gain a better understanding about mental health issues. I’m frequently encouraged to hear how important Living Room is when I hear the stories from members of the group. At the last meeting there was a man and his wife who were strong members of his church but never felt free to talk about about his bipolar disorder there. They kept his disease a dark secret – a burden for which they received no spiritual support. Being able to talk about his problems in the Christian setting we provided gave him tremendous relief. It was a release he very much needed. There are many stories. Too many to share here. But I feel a passion for this program and think it needs to extend to communities everywhere. I know it will take time. People have to feel free to share their problems with the disorder with their church family. PLEASE NOTE – Today, in 2019, go to https://www.sanctuarymentalhealth.org/peer-support/ for Living Room information.